Another week of just my Make Ahead posts... alas, another crazy week gone by. So now I’ve become one of those divas complaining about how busy they are (to my whole two followers.) I’ve got three other posts started on sewing projects I’ve been up to but just haven’t had the time to finish them. I’m glad I started myself on a weekly post series so I at least feel like I have a deadline for posting weekly. Week 3 of Make-Ahead Mondays! 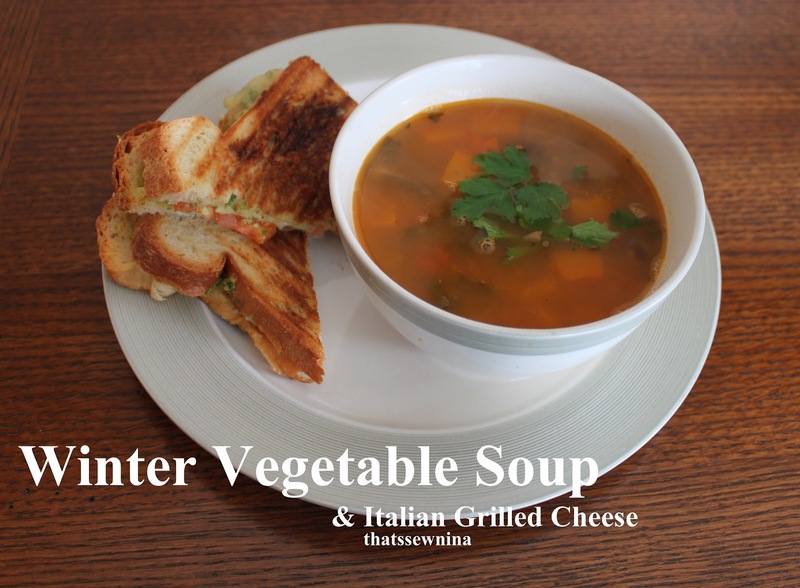 How about some delicious homemade vegetable soup… right out of my freezer. I caught this recipe on an episode of “The Best Thing I Ever Made” on the Food Network. The recipe is from Alton Brown. It was coming up on lent at the time and it sounded like an awesome Friday night meal. Not only did I got for it, I doubled it and froze TEN (YES! TEN!) quarts of the stuff and have enjoyed every bite of it. It’s a lot of ingredients I’ll admit, but hey, it’s vegetable soup! It’s supposed to be a trip down the vegetable aisle. *I cut these babies into chunks then whipped them through the food processor. 10 quarts of soup ready for the freezer after doubling the recipe! ...plus the TWO quarts I was able to make for the night of serving. Do yourself a favor and prep all of your ingredients in advance. It’s a lot of chopping and measuring so this will save you a ton of time and frustration in the end. Place 2 tablespoons of the olive oil into an 8-quart stockpot over high heat until the oil shimmers. Add the mushrooms and saute until browned, about 5 minutes. Remove the mushrooms from the pan and set aside. Decrease the heat to low, add the remaining 2 tablespoons olive oil and the carrots, celery, onions and salt. Cook, stirring occasionally, until softened, about 30 minutes. Add the tomatoes, sage, rosemary and garlic, and cook for 5 minutes, stirring to break up the tomatoes. Add the water, soy sauce and Parmesan rind, increase the heat to high and bring to a boil, about 15 minutes. Decrease the heat to low, add the squash and kale, cover and cook until tender, 30 to 35 minutes. Return the mushrooms to the pot along with the beans and red wine vinegar and cook until all is heated through, about 15 minutes. Remove the cheese rind and serve warm with shaved Parmesan. If you’ve got an extra few minutes and are looking for something hearty to put on the side, try my Italian Grilled Cheese! I love it with fresh mozzarella but in this case, I just used some extra cheese I happened to have in the fridge. Don't be too picky. The pesto is so strong a flavor, it steals the show. Slather the insides of your bread with the pesto sauce. Stack a layer of tomato and a layer of cheese. Lightly butter the outside of one side of your sandwich. Place it butter-side down on a medium-hot griddle pan. (I use a grill pan to get that Panini look). Smoosh it down (seriously). After a few minutes flip to the other side and smoosh again. I think this helps it all meld together so that the tomato doesn’t slide all over the place. Cut in half on the diagonal and serve alongside your soup. Not too busy to enjoy the season finale of WALKING DEAD! Now I'm off to it!